David Schwarz leads Board Direction. No one knows more about how to gain a board appointment or develop a board career than David. He has written the internationally selling Board Appointments Book - 'The definitive guide to finding and gaining a board appointment' and, with more than a decade of international board and executive recruitment experience, has personally written and reviewed 000's of Board CVs. 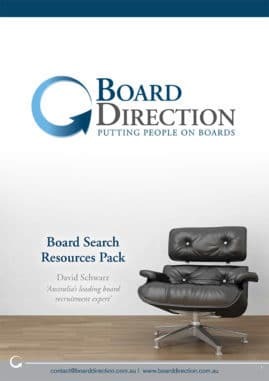 He also advises on how to get the most value from board members and the process of how to create boards that drive value for the organisations they represent. David has been recognised in the press as a leading executive and board CV writer and Australia’s leading board recruitment expert. He has also been featured in the Financial Review’s BOSS magazine and speaks regularly for organisations such as Governance Institute of Australia, Sydney University’s Graduate School of Management (AGSM) and the CEO Institute. David is also a Top 10 LinkedIn user with over 26,000 NED LinkedIn connections and has advised thousands of clients on how to develop a board career or gain their first board directorship. He has personally helped thousands of individuals gain board appointments.